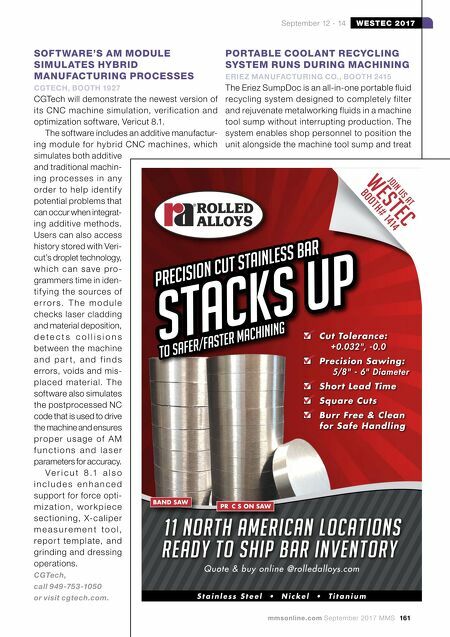 160 MMS September 2017 mmsonline.com WESTEC 2017 September 12 - 14 MaxQ delivers unmatched material removal rates at high speeds for a diverse range of materials from steel, cast iron, stainless and exotic metals. No matter the challenge, Take It On! LMT Onsrud LP 1081 S. Northpoint Blvd Waukegan, IL 60085 Phone 800 234 1560 M A X I M U M M AT E R I A L R E M O VA L R AT E F O R M A X I M I Z E D P R O F I TA B I L I T Y Visit www.onsrud.com for more information without the use of heat. Omax will also feature its Intelli-Max Premium control software, which is compatible with more than 90 different file formats, including all major CAD program file types, plus graphics file formats such as JPG, GIF and PNG, enabling many 2D and 3D part files to be imported into the software. Omax Corp., call 800-838-0343 or visit omax.com. COMPUTER TOMOGRAPHS PROVIDE FLEXIBILITY WITH SPEED, LARGE MEASURING RANGES ZEISS INDUSTRIAL METROLOGY US, BOOTH 1803 Zeiss will highlight its Metrotom 800, which has an ex tended per formance spectrum, and its Metrotom 1500. These computer tomographs are designed to address companies' need for flexibil- ity as new materials and hybrid processes are developed, with features including speed and large measuring ranges. 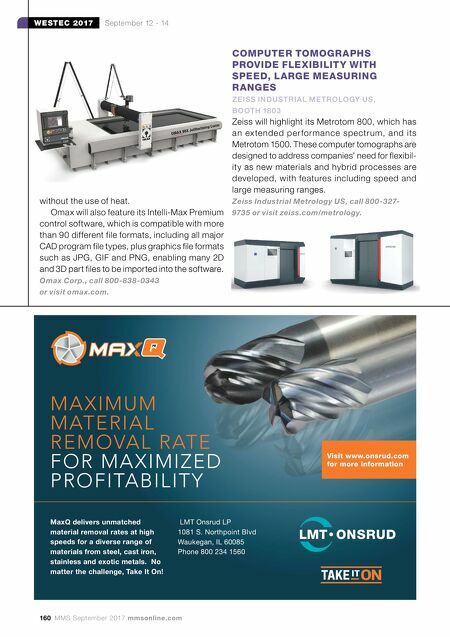 Zeiss Industrial Metrology US, call 800-327- 9735 or visit zeiss.com/metrology.